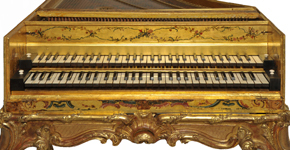 more images and detailed information about this splendid instrument. 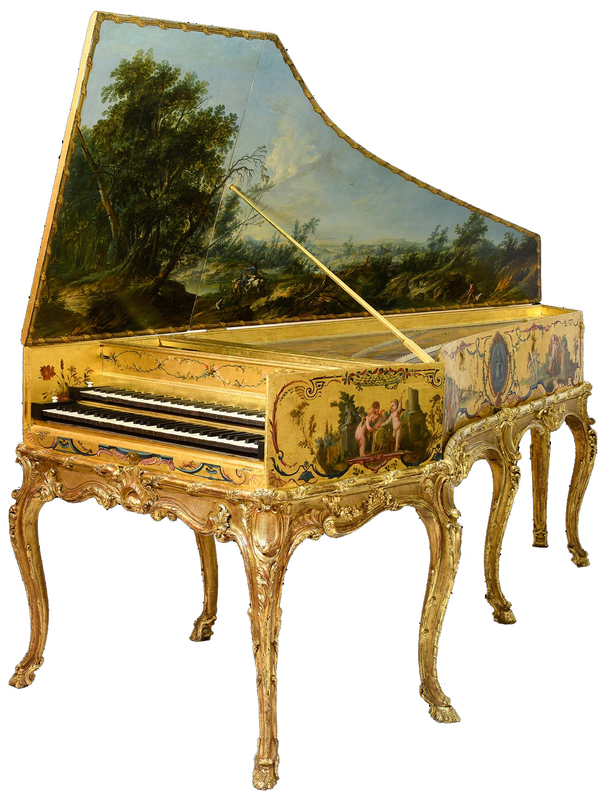 This stunningly beautiful Franco-Flemish double-manual harpsichord started life as a so-called 'transposing' harpsichord made in Antwerp in 1617 by and unknown maker. Then, much later, it was ravalé in Paris in several stages during the period from about 1735 - 1786. The instrument has had an amazing history ranging across much of Western Europe, the United States and South America. 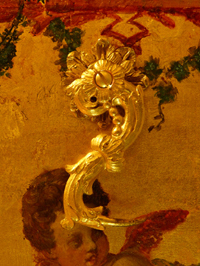 It was decorated in gold vernis martin in 1750, perhaps replacing an earlier vernis-martin decoration. It was given a first grand ravalement in 1750 widening the case and increasing the bass compass. The author of this ravalement can be conclusively attributed to François Étienne Blanchet who later became 'facteur des clavessins[sic] du roi' to Louis XV. At the same date it was given the present elaborate decoration with figures of gods and cupids attributed to the circle of François Boucher and ornaments around the Boucher figures attributed to Christophe II Huet. 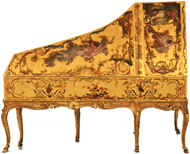 It seems highly likely that it was given its extravagant decoration because of its amazing sound and it is, indeed, still today one of the finest-sounding instruments in the history of French harpsichord making. 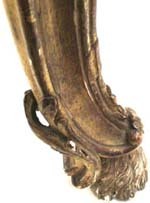 It may have played an important role in the social and musical life of the French Court at the time of Louis XV. But its history does not stop in the eighteenth century, and it also turns out to be a very important document in the history of the modern revival of interest in the harpsichord and its music. It was restored by Louis Tomasini and was played in the concerts given by Louis Diémer during the 1889 Exposition Universelle. Its modern history involves some very important figures who influenced major world events - not necessarily involving music nor furniture decoration! 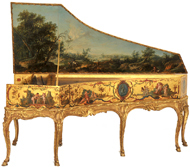 The latest thoughts on the ravalement and decoration of this instrument by François Étienne Blanchet, Christophe II Huet, and François Boucher. Click on the images and links below for more information. Click on this image to see details of the 1927 Sotheby's sale catalogue. Some important personalities in the French court around 1750. 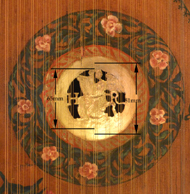 The following 4 images on the right all show clear evidence of the work of Christophe II Huet in the decoration of the instrument.